The global retro-reflective materials market was projected to reach USD 14.0 billion by 2024, at a CAGR of 19.0% during the forecast period. 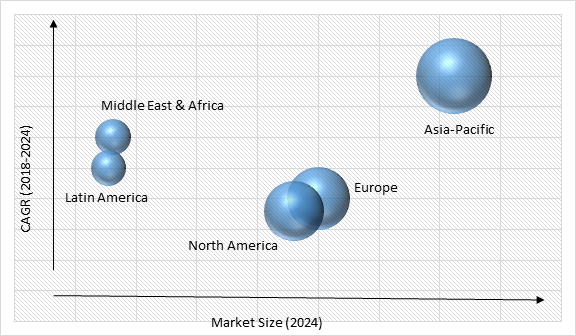 The global retro-reflective materials market is projected to witness a significant growth in the coming years owing to the stringent government regulations regarding worker and vehicle safety. These materials are used to increase the night time conspicuity of traffic signs, high-visibility clothing, and other items. In the light of an approaching vehicle, this makes them safe and effectively visible. Also, they are primarily used as a material to increase the barcodes scanning range in factory setting. On the basis of technology, the market is classified into microprismatic, glass beads and ceramic beads. The microprismatic segment is anticipated to register the highest growth in the retro-reflective materials market during the forecast period. Microprism enables minimum scattering of light while also ensuring maximum reflection of the light back to its source. The maximum growth is also attributed to the high focus of manufacturers to provide products with a better retro-reflective property. Based on product type, the retro-reflective materials market is categorized into films, sheets & tapes, paints, inks & coatings, and others. The films, sheets and tapes segment is projected to lead the market in the coming years, owing to their wide range of applications in different industries such as construction and infrastructure, apparel, automotive and transportation, and others. On the basis of application, the retro-reflective materials market is categorized into traffic and work zone, conspicuity, fleet and vehicle registration, personal safety, and others. Among all these, the traffic control and work zone category is anticipated to register the highest growth in the market during the forecast period. This is attributed to the increasing use of these materials in construction activities, as these materials are used on roadways, highways, warning signboards, guidance signboards, information signboards, and others. Along with that, these materials are also used for work zone products which include barricades, cones, drums, and various others. Growing demand of these materials to enhance night time and low light condition visibility, increasing consumer spending in developing countries, and strict government regulations regarding vehicle safety and worker safety are the major factors driving the retro-reflective materials market growth. These materials are generally used on road signs and also on pavements, where level of reflectivity must meet established standards. For instance, according to European Union standards, pavement markings should be visible to the average motorists which provide them a minimum of 2.5 seconds of reaction time after dark. Also, the choice of road sign colors are also guided by reflectivity concerns, for example, red and yellow colors are used more frequently, as they attract attention sooner as compared to other hues. Low awareness of safety products in developing economies, limited shelf-life of retro-reflective products, and high manufacturing cost are among the major challenges identified in the retro-reflective materials market. Despite the numerous efforts by the government of various countries, the awareness regarding the safety products is quite low in developing countries such as India, China, and others, which is a major challenge hindering the growth of the market. The retro-reflective materials market is highly fragmented and the dominant players are using different strategies that include expansions, product launches, agreements, joint ventures, mergers and acquisitions, and others to increase their presence in this market. Globally, Asia-Pacific is the largest retro-reflective materials market, owing to the expansion of various industries in the region including construction and infrastructure, automotive and transportation, and others. Due to the rise in construction projects to meet the infrastructure demand of growing population, the Asia-Pacific region is anticipated to witness the fastest growth in the market. Some of the key players operating in the retro-reflective materials industry are 3M, Avery Dennison Corporation, Changzhou Hua R Sheng Reflective Material Co., Ltd., Coats Group Plc, Dominic Optical Inc., Nippon Carbide Industries Co., Inc., Reflomax, Asian Paints PPG Pvt. Ltd., Paiho Group, Orafol Europe GmbH, JRC Reflex SAS, and Halo Coatings. 11.3. Changzhou Hua R Sheng Reflective Material Co., Ltd.
11.6. Nippon Carbide Industries Co., Inc.
11.8. Asian Paints PPG Pvt. Ltd.
Table 102 Snapshot – Changzhou Hua R Sheng Reflective Material Co., Ltd.
Table 104 Snapshot – Dominic Optical Inc.
Table 105 Snapshot – Nippon Carbide Industries Co., Inc.
Table 107 Snapshot – Asian Paints PPG Pvt. Ltd.
Nippon Carbide Industries Co., Inc.